Gustin Navy Baby Gingham Shirt ($76). Gustin Japan Denim Jeans ($89). Gustin Black Roller Belt ($51). Gustin Duffle Bag ($127). Oak Street Bootmakers Camp Boot ($348). J.Crew Wallace & Barnes Bomber Jacket ($188). Corter Leather Luggage Tag ($18). Garrett Leight California Optical Sunglasses ($315). ($249). Omega SS Speedmaster Watch ($5,850). Vintage New York City Postcards ($20). This edition of Garb is presented by our friends at Gustin. Timberland Earthkeepers Destin Shoes ($90). Timberland Earthkeepers Rugby Shirt ($68). Timberland Hookset Backpack ($90). Timberland Earthkeepers O-Ring Belt ($55). Raleigh Denim Jones Jeans ($295). Scout Pocket Knife ($98). Pentax Q Camera ($300). Apolis Washed Linen Bandana ($38). Apple Magic Mouse ($69). Vintage Photography Magazine ($15). Vintage Rolex GMT Master Watch ($8,900). This edition of Garb is presented by our friends at Timberland. Frye Greene Tall Lace Shoes ($168). Frye Logan Overnight Bag ($598). Frye Logan Dopp Kit ($178). John Elliott + Co. The Cast Graphite Jeans ($265). Barton Perreira Collins Sunglasses ($510). 3Sixteen Heavy Pocket T-Shirt ($85). Vela Series-A LayFlat Computation Laboratory Notebook ($13). Zippo Armor High Polish Brass Lighter ($18). MoMa Muji Black Cotton Buds ($7). Bell & Ross Marine Chronograph Watch ($13,600). Tonfisk Warm Tea and Coffee Pot ($145). Pendelton Acadia National Park Blanket ($199). Compact Cabins Book ($11). Tanner Goods Standard Black Belt ($105). General Manufacturing Wilson Keyring ($12). 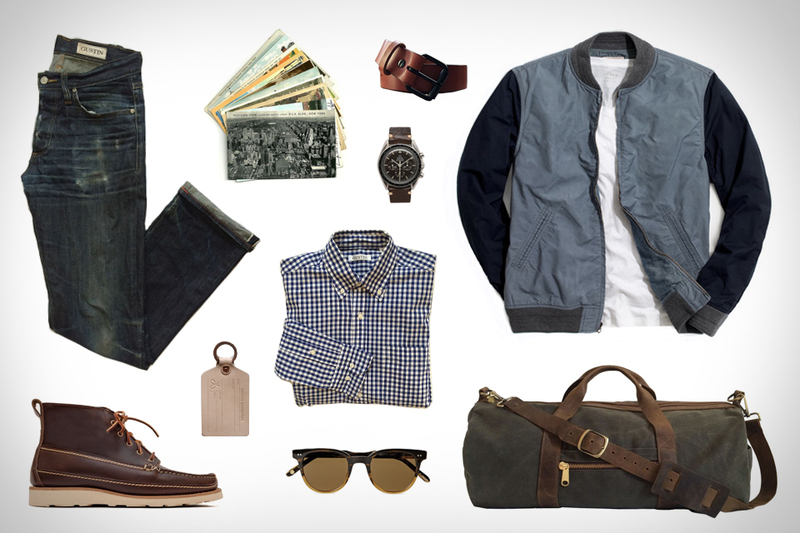 This edition of Garb is presented by our friends at Frye. Nau Tripoly Jacket ($255). Nau Utilize Pant ($100). Nau Lightbeam Pod ($110). NN.07 Derek Camouflage Shirt ($165). Blink Steady Rear Bike Light ($125). Bern Watts Bike Helmet ($60). Knog Bouncer U-Lock ($42). Asics Onitsuka Tiger Shoes ($75). Giro LX Bike Gloves ($65). Full Windsor Nutter Cycle Multi Tool ($68). Citizen Eco-Drive Watch ($140). This edition of Garb is presented by our friends at Nau. Don't let the overcast skies scare you off the beach. Timberland Earthkeepers 2 Eye Boat Shoe ($99). Timberland Waterproof Wharf Bomber Jacket ($138). Timberland Earthkeepers Lakeville Tote Bag ($75). Saturdays Esquina Oxford Shirt ($98). H&M Twill Pants ($30). Ray-Ban Clubmaster Classic Sunglasses ($150). Miansia Beacon Rope Bracelet ($95). 1952 Paperback The Old Man and the Sea ($15). Ebbets Ballcap ($40). Nivada Grenchen Chronograph Watch ($1,650). AIAIAI Pipe Headphones ($40). Pack the brauts, beverages, and balm. Gant Rugger Nylon Hoodie ($225). Gant by Michael Bastian Oxford Shirt ($175). Gant Denton Sunglasses ($125). Gant Rugger Silk Flower Belt ($120). Rogue Territory Officer Trousers ($185). Tudor Heritage Black Bay Watch ($TBA). Billykirk Bottle Opener ($20). Mismo Express Bag ($430). Vintage Thermaster Cooler ($54). Vans J.Crew Sneakers ($60). Burt's Bees Lip Balm ($4). This edition of Garb is presented by our friends at Gant. You don't have to be a scratch golfer to enjoy the links. Maide Spottington Sweater ($98). Maide The Nassau Shirt ($88). Maide Highland Pant ($108). Bonobos Fifth Degree Black Belt ($98). IWC Ingenieur Watch ($6,600). Cutler and Gross Sunglasses ($500). Nike Golf Lunar Clayton Shoes ($250). Neutrogena Ultimate Sport Sunblock ($11). Callaway Opti-Grip Gloves ($24). 75 Count Pride Golf Tee Deluxe ($14). Rose and Fire Putter Head Cover ($60). This edition of Garb is presented by our friends at Maide Golf.